My daughter says “you are writing about the olive harvest again”. Firstly, for me that is what I am doing most days, but secondly it is a key economic, social and cultural event for Palestinian communities at this time of year. I think it is important for people to realise just how hard it is for Palestinian farmers, what they face each year and the unbelievable injustice of to access their land, in a sea of injustices. 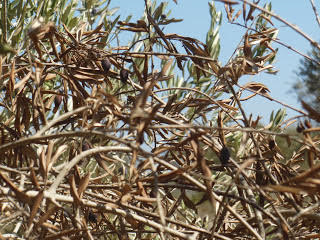 Trees not given the attention that is needed do not yield the olives. Palestinian farmers are not allowed free access to their lands near illegal settlements. Some farmers are allowed limited permits for a few days to collect the olives, but some are denied it completely. These permits are never for enough days and not necessarily at the right time. They are often changed for arbitrary reasons. This restrictive regime prevents farmers from carrying out essential year-round maintenance such as ploughing, pruning and fertilising which in turn undermines the quality and quantity of the yield. 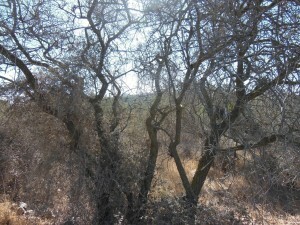 Farmers not able to maintain their trees properly. Settler violence also poses a serious challenge for many Palestinian farmers. 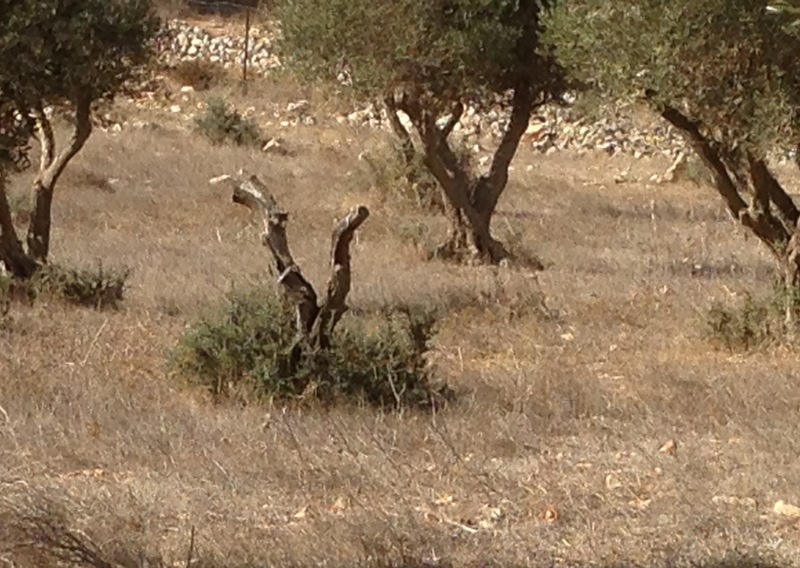 Palestinian-owned olive trees have been damaged, uprooted, poisoned, burnt down or harvested by settlers. It seems that the Israeli authorities have sought to implement a system to limit Palestinian farmers’ access to olive trees near settlements to a few days a year; Israeli soldiers are deployed to support their access during these periods. Most years they do not in fact “protect” the farmers from settlers, but this year they appear to have orders to do so which has resulted in fewer attacks on farmers. It is however ineffective in preventing the vandalizing of olive trees throughout the rest of the year. Although fewer attacks on the farmers is a good thing, it normalises what is happening; the requirement for Palestinians to get permission to tend to their own land. The farmers are denied access to their lands instead of stopping what the settlers are doing. The children of these settlers are often involved. Trees cut down by settlers in Burin. As was explained to us one night by a farmer, the permits are to suit the convenience of the soldiers not when the crop is ready. A week too early and only a half yield, a week too late the rain may damage the crop. If it rains on permit days- tough- you don’t get extra time. Also, any farmer/gardener knows that not all crops ripen at the same time. The farmers need to be looking at their crops and deciding when is the right time to harvest them. In Deir Istiya a farmer wanted to harvest their olives last week. A humanitarian organisation had provided money to pay Palestinian workers to help with the crop. This provided work for unemployed Palestinians and helped the farmer with restrictive times. The soldiers did not allow the first day because the workers were from another village. The farmer went back the next day with family and friends from the village, but they were not allowed because there were not enough soldiers to “manage” the number of olive pickers. It would be laughable if not so serious. You cannot be in this country without being angry. Remember the settlements are illegal under International law and are expanding each year. What land is left for the farmers is difficult to harvest by a system that penalises farmers by limiting their access, rather than enforcing the rule of law on violent settlers. The vast majority of complaints of settler violence against Palestinian farmers, and their property, that are filed with the Israeli Police are closed without indictment. It is difficult to accompany farmers and be turned away, or later in the day be sent away or just to have the menacing presence all day. It is difficult to keep quiet as we are often asked to be by the farmers, who are so dignified. It makes me feel angry and impotent.